Without a doubt one of the best RPGs I have ever played, Arx Fatalis is a highly underrated masterpiece by French developer Arkane Studios. In Arx Fatalis, Arkane has successfully combined the graphical pizzazz of 2002 technology with the in-depth gameplay from the heyday of computer gaming – let's say around the time of Looking Glass' Ultima Underworld. If you are a fan of Looking Glass who thinks Ultima Underworld III will never see the light of day [except in the form of Underworld: Ascendant] because Looking Glass has gone defunct, your wait is over. The fantasy setting is both intriguing and perfectly explains the diversity of the game's underground environments. In this fantasy world populated by goblins, trolls and the other common RPG staples, humans have been driven to live deep underground since the planet surface is no longer habitable after the sun burned out. As you begin the game a prisoner with complete amnesia, the kingdom of Arx is facing a most dangerous threat: the evil god Akbaa is about to return, thanks to his fanatical followers. But before you begin performing heroic deeds, you must first find a way to regain your memory - and fill an empty stomach. Before you begin the game, you must first create a new character. This part strikes a good balance between statistics-heavy mode in hard-core RPGs, and simplistic hack 'n' slash. You can allocate points to different attributes such as strength, dexterity, etc., as well as dozens of skills that have impact on gameplay. The first thing you will notice after character creation is that Arx is a very good looking game. Even when I play it on an Athlon notebook computer with standard DirectX but no 3D card, the graphics are nothing short of spectacular. The architectural designs of man-made structures such as the town of Arx and the Temple of Akbaa in particular are excellent. This is a lively world - a world full of people and creatures and monsters that you will want to revisit over and over again. The second thing you will notice is how 'transparent' the game interface is. Arkane Studios states that one of their goals in Arx is to never take the player 'outside' the main game window (e.g. switching to a 2D screen when you enter a shop), and they have succeeded in spades. You can perform every action in Arx in real-time, in the game proper, by a combination of keystrokes and mouse clicks. When you want to buy weapons from a blacksmith, for example, all you have to do is double-click on a chest in his store to see its contents, then drag the item you want to buy into your inventory, which is permanently displayed at the bottom of the screen. The cost of the item will be deducted from your gold total. Similarly, you can sell unwanted items by simply dragging the item from your inventory over to the blacksmith's chest. You can even repair your weapon by double-clicking it (the game's default for "use" command) on the blacksmith (if you want him to fix it at a price), or on the anvil if you want to fix it yourself. This extremely intuitive, user-friendly interface allows the highest interactivity possible in a game, and helps maintain the incredible level of immersion in the gameworld. How about magic, you may wonder - won't the game have to take you out to a special casting screen to prepare the spells? Here is yet another area where Arx Fatalis really shines. Similar to the spellcasting system in Black & White, you cast the spells with the innovative "onscreen gesture based magic system". Keeping the left mouse button and a key pressed, you can draw runes in mid-air. A typical spell comprises 2-3 runes, so a series of these mouse gestures combine to create dozens of different spells. This is a wonderful and intuitive system that more first-person RPGs should use. So the game succeeds in immersing you with gorgeous graphics and excellent interface - but that immersion would quickly dissipate had it failed to sustain your interest in the story. Fortunately, this is not the case: the plot evolves from the mundane "I must regain my memory" to something much more dramatic, full of sub-plots, plot twists, and interesting characters each with their own agenda. The writing is excellent throughout, and the voice acting is quite good. There are many optional side quests in the game, and most of the quests can be successfully solved in at least two ways depending on the type of character you are playing (although I noticed that many quests can be solved very quickly if you play a thief, i.e. have very high stealth skill). If you want to finish all the side quests and see all there is to see including all the secrets, Arx Fatalis will easily take you over 100 hours to finish (although much of this time will be spent searching for shortcuts from the different levels). There are many more great things I can say about Arx Fatalis, but I will leave it to you to find out lest I spoil the surprises. It is too bad that Arkane did not receive permission from EA to label the game Ultima Underworld III - because this is exactly what it is (the game even has a hidden UW mode that you can reach by casting secret runes), down to the tiniest detail. Fans of Origin's classics will be delighted at the excellent attention to detail: everything you pick up has a weight, for example, and the ways you can interact with the environment are staggering: you can cook raw meat and fish, use the fishing pole to fish, bake cakes from raw ingredients, and combine different items to make new objects. Simply put, Arx Fatalis is the best dungeon romp I have played since… well, since Ultima Underworld 2. 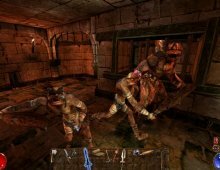 If you love the kind of dungeon romp that completely immerses you into its world, you simply cannot miss Arx Fatalis. Two thumbs up, and an honored induction into our Hall of Belated Fame.